Adaptive Worksheets is owned by Silver Lining Multimedia, Inc. We have been producing special education materials since 1998. 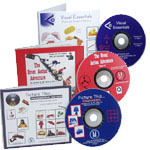 Although our photo CDs were originally designed to help individuals on the autism spectrum, our products are now used by a wide range of clients who are visual learners. We also offer supplementary materials such as the Teaching Hands Clock and Kit.